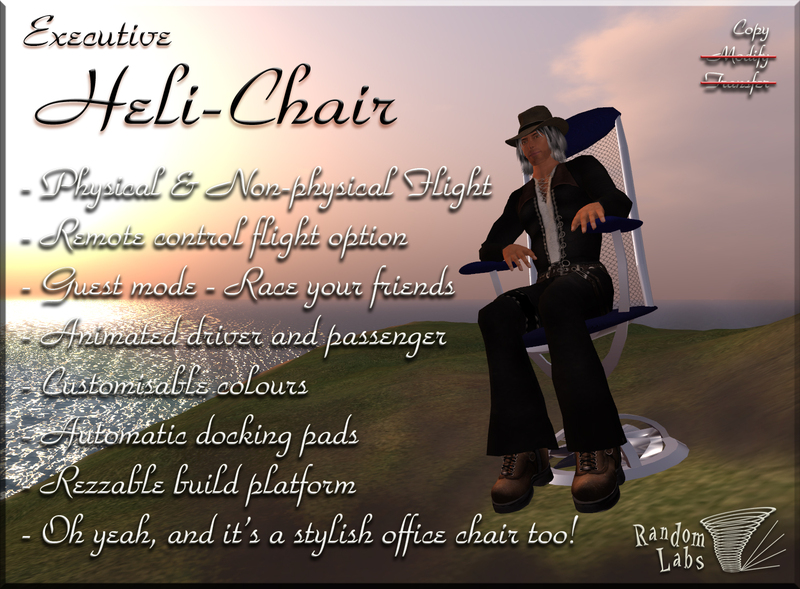 As well as being a stylish office chair, the Heli-Chair is a unique personal 'hybrid' vehicle, meaning it has both physical flight, for a smooth ride, and non-physical flight, for getting straight through walls and obstacles. Fun for exploration and racing your friends, and useful for sandbox safety from the bumps and push attacks of unsavoury avatars! You can carry a friend with you in the passenger position on the back of the chair, or even rez a copy for public use and let them fly their own! It also includes a rezzable build platform for building on and automatic docking pads for accurate parking. ''Hybrid' Vehicle - Instantly switch between physical and non-physical flight for moving through walls or protection from griefers. 5 speed gearbox provides speeds from 10 to 50 meters per second. Chair will automatically switch to non-physical flight for smooth sim border crossings, even at high speeds. Animated driver and passenger positions. Colour Change menu allows you to customise the colours of the arms, seat, headrest and metal parts of your chair. Remote Flying - Starting the chairs engine when you are not seated will allow you to take remote control of the chair. Public Use - With public use enabled your friends will be able to play with your Heli-Chair. You can also still choose to fly the chair remotely while others are seated. *NOTE* Chairs left in public mode on land parcels not owned or rented by the owner will disable public use after an hour with no seated avatars. Dust Cloud particle effects while flying low over the ground and objects (when in Physical flight mode). Engine sound effects - The Heli-Chair is powered by a Vespa scooter engine! Keyboard - Optional automatic keyboard and typing animation while seated in your chair.